In 1928, Walter P. Chrysler was riding high. After only four short years of manufacturing, the Chrysler Corporation had risen to third place in the American motor industry. Acquiring the Maxwell plant in 1924, the first Chrysler cars came off the line late that year. Featuring four wheel hydraulic brakes, steel body construction, and a powerful six cylinder engine, Chrysler cars caught on quickly. 1928 was a significant year for the company. First, the Chrysler Corporation acquired the Dodge Brothers Motor Company, along with its 3,000 franchised Dodge dealers. Then came the brand new Plymouth to compete head to head with Ford and Chevrolet in the low price field. And finally DeSoto, was the first DeSoto models introduced to the public in 1929. For over thirty years, DeSoto was a proud entry in the marketplace, finally fading from the scene in 1961. It was a good car, but it experienced difficulty finding its proper niche in the marketplace. Its problem: under the skin it was really a Chrysler, with little or no significant difference from the Chrysler Corporation’s popular flagship car. Therefore, DeSoto became something of a stepchild to Chrysler, much as LaSalle had became to Cadillac. DeSoto prospects oftentimes chose to pay just a few dollars more to enjoy the prestige of driving a car with the Chrysler nameplate. This 1937 DeSoto business coupe has some interesting features. The seat back folds forward, and behind it are shelves for salesmen’s samples and/or sales literature. The rear compartment is very large enabling the businessman to carry merchandise, protected from weather and theft. 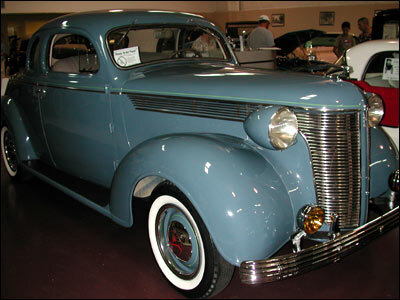 A radio and other deluxe features made the DeSoto business coupe a cut or two above ordinary business cars of its day.